Ten years ago, most people believed that charity was charity and business was business. They were separate strands that didn’t intersect, let alone intertwine. Acumen Fund has done much to reprogram this conventional thinking. Thanks to the efforts of founder Jacqueline Novogratz and her dedicated team, a new DNA was created to fight poverty – one weaving together business and philanthropy into double helix of impact. At NextBillion we salute Acumen’s efforts, which not only have shaped the social enterprise sector as we know it and continue to understand it, but have left an indelible influence on the discussions, debates, insights and modes of thinking found on the pages of this web site. (After all, Acumen Fund was one of the founders of NextBillion). We’ve learned a lot from each other, and as Acumen marks this 10-year-milestone, we’d like to help them look ahead – toward the next ten years. 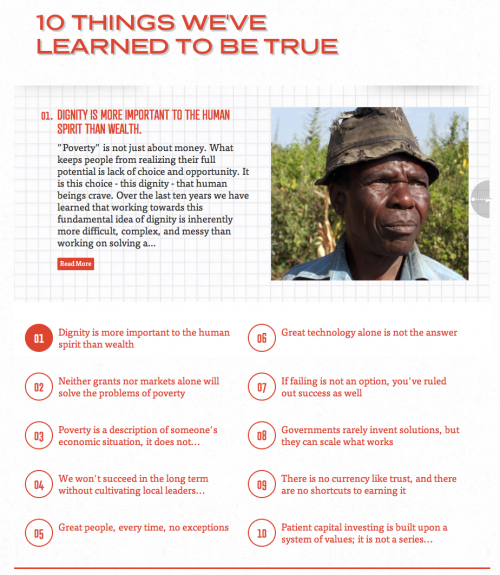 Acumen Fund recently reflected on its decade of action with the 10 Things We’ve Learned About Tackling Global Poverty series. Now it’s your turn. We invite the NextBillion to leave your own observations, thoughts, questions and suggestions on some (or all!) of these lessons, which maybe found here in interactive form. How have your own experiences related to the 10 Things? How do you approach social enterprise as a result? And, if you like, what lessons would you add to this list? We hope to keep this discussion going well into the New Year, so please leave your comments on this post.